WALLSEND GOLF CLUB held their second annual fundraiser for SOS on Saturday and presented us with a cheque for a massive £1250.00. Thanks to Dave Souter, Derek Latimer, Davey Allen and the staff for their hard work and support and to all the members who played and bought merchandise and gave donations. Fantastic result. 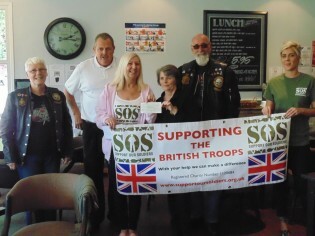 Thanks again to the Bad-Landers MCC for being part of our support team and who are always ready to help SOS. It made our day even extra special when we got home to a lovely bluey from one of our Gurkha`s. Perfect! !